Ask fellow campers about "Lake George RV Park" and nearby attractions. Although this is a large park, the first impression is that with all the large tree's our site felt very private. It was off season, so relatively quiet. Also of all their activities, pools, theater, etc. most things were shut down. I felt that there could have been a price break for limited amenities late in season, otherwise would highly recommend. Very nice well equipped store. We camped at Lake George RV Park in a Fifth Wheel. We stayed the weekend of September 21, 2018 for the balloon festIval. The resort was beautiful and very clean. There is a new splash pad for the kids, an arcade and a trolly that will bring you around the campground and to the village. There's a food/ice cream bar above the pool area. Prices were average. There is a theatre that has different shows scheduled. The only draw backs were that there were not scheduled activities for the kids. The other draw backs were that the hot tubs were not hot enough and all aged kids were allowed in the tubs. No age restrictions.There were kids everywhere in the hot tubs, splashing and kids going under water with goggles on. (Even with an adult present). If the tubs were hotter, I think the younger kids wouldn't be in the tubs. Not very relaxing for the adults. We camped at Lake George RV Park in a Fifth Wheel. Very close to lake George Village shops. There are plenty of different types of sites. Secluded or close to neighbor. First VERY expensive at $78 for what is somewhat of an off season, but this is a very nice campground. One of the few campgrounds we have visited that have paved roads throughout the campground. If you have a large RV it can be difficult maneuvering the roads in the campground. Low tree limbs are not a problem. Our site was level but completely covered by trees. We don't camp, but travel for months at a time in our motor home ,so good satellite reception is important for us. Don't even think about getting satellite reception here. Office told us no problem getting satellite reception at our site. Wrong, couldn't even see the sky from our site in any direction. Good news is there is free cable with HD channels and some of the more popular cable/satellite channels. There is free WiFi at this campground with good performance. 3.25 Mbps download, 3.56 Mbps upload and a ping of 103. Water press is somewhat low. Water pressure somewhere between 32 psi and 36 psi. You might want to fill your tank then use you pump for good water pressure. I would have rated this higher by $78 a night it's not worth a better rating at that price. We camped at Lake George RV Park in a Motorhome. Lots of history nearby. Very interesting for the history buff. I was so disappointed in this Rv Park. First of all with all the awards I was expecting so much more. I guess my idea of a Resort is so much more than some people. If you are looking for a very tight, cramped space with a lot of kids and activities, then this may be the place for you. It was full of tents, and tarps and not very appealing at all. Yes, the roads are paved, but the sites are grimy, dirty and not at all appealing. I was so thankful that we only booked for one night and absolutely could not wait to leave. I travel in my RV for work, and this just happened to be a great location for a stopover. However, If I had booked more nights I would not have stayed here. We could not even get our awning out for the trees and pulling out of the site, we scraped our RV on both sides with brush. This is not acceptable to me for any RV park! The road to exit the park is very tricky with a big rig. If you are looking for a party place to gather with a bunch of kids and friends and you don't care what everything around you looks like, this may be for you. We had been told that we could get satellite, but that was totally out of the question, It is a great location if you want to just shop or be in this area, but it is so overpriced for the appeal of the park. I would never stay here again. We camped at Lake George RV Park in a Motorhome. I booked this one thinking it was an Adult-only upscale park. Don't get me wrong, love kids etc., just thinking that with all the amenities offered here (movies, live shows) it might be fun to interact with folks are age (68) in a calm setting since we have been traveling over a month at this point, two-three nights in a spot. Whoops. This is a family park and it was stocked full of kids and partying adults. Didn't know the big Balloon Festival was in town. The park is HUGE and does offer an incredible array of activities for families. 30 years ago, we'd have been in the mix. Staff were friendly, fast & professional. Spaces are ok, tight; we were in the outer loop, back in, and while it was ok, parking the tow vehicle perpendicular to the space, in front of the trailer was required. As said, tons of families having a great time. We'd stay again, but not on a "special weekend" :) Got kids? looking for a fun place to camp? This is it! We camped at Lake George RV Park in a Fifth Wheel. If this interests you, large modern outlet mall right around the corner and a large amusement park nearby. This RV resort is simply AMAZING! They have so many amenities that you could stay a week and never leave. Free Live shows, Paddleboats and movies which is almost unheard of. Yes it's a little pricey but you really get what you pay for. 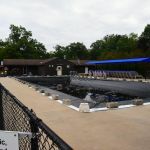 There are tennis courts, pickleball courts, shuffle board, horseshoe a stocked fishing pond, Family Bingo (in season), a HUGH Dog park for both large and small dogs so even the family pooch can enjoy camping, the list goes on and on. ALL roads in the park are paved so it is NOT dusty and easy to ride bikes. All sites have 30 and 50 amp service with free WI-FI, sewer and a great cable TV package with HUGH fire rings with picnic tables. The park is very clean and as soon as a site becomes available, the maintenance is there to clean it and scoop the fire pits. The store is very well stocked with many items so you never have to leave and friendly staff. There is a free trolley service that runs the entire park and also brings you out to the shopping outlets which are out on the main road, about 1/4 mile away. There is also a trolley service ($1) that runs up to Lake George village and back. I have been staying here for many years and feel that this is THE place to stay as we always compare other RV resorts to this place. Next year is a planned water slide park to make this place even better! I can sum this place up by saying, you must try this place to believe it. We camped at Lake George RV Park in a Fifth Wheel. Huge park located about a mile off I-87, 3 miles from Lake George Village. We arrived mid week, and no one was in the guard shack. We proceeded to the office for check in. They do have someone in the guard shack for the weekends that will direct you. Check in was efficient. Staff very friendly. The park is heavily wooded. The roads are ok for big rigs, paved, just wide enough, some tight turns and hilly roads on the upper portion. We bottomed out on a steep dip when getting to our site. Our site was extra long and wide. Pull thru, full hook up, fire ring, picnic table, heavily wooded therefore no satellite but they have good cable. The site was dirt, and it rained, which caused a mess. Water pressure was good. Beautiful, good size dog park. Big area for large dogs, which we have, it was great to let them run and play with other dogs. Great green space to walk dogs around park. Internal trails that take you by two ponds and around the park. They have laundromats, didn't use them, but checked them out. Modern machines, wash $2.00. dry .25 for 10 minutes. Wi-Fi was good until Friday when more people come in, then spotty. Multiple pools, including an indoor pool. 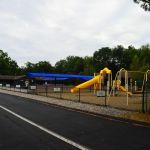 There are arcades, playgrounds, tennis/pickleball courts as well as additional activities for kids & adults. There is a café, and the office has a good size store. 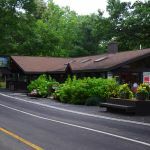 There is also a trolley service to Lake George Village, but after labor day, the trolley didn't run, and the café wasn't open. We arrived after Labor Day, it was quiet until the weekend, then the park became noisy. This park would have received a higher rating if the site wasn't all dirt. Close to outlets, restaurants and six flags park. We camped at Lake George RV Park in a Motorhome. Way overpriced for off-season. For $68/night, there should be paved campsites for RVs. Instead it is mostly dirt and grime. Although far away from most campsites, there is a large dog park with large & small dog areas, restroom, indoor dog wash station, etc. Sewer connection poor as draining must compete with water level within the sewer pipe. Many of the activities were already shut down for off-season although we were charged the full price. Very nice selection of goods in the store, although very high priced. For example, a ground mat is $79 compared to $49 in Walmart for the same mat. We camped at Lake George RV Park in a Motorhome. Shop around for a more reasonably priced campground. Thank you for your review of our facility. I am surprised that you thought our off season mid-week pricing was expensive. Our rate includes 50 amp electric, water, sewer, free WIFI and 72 channels of cable(many digital HD as well). As is customary in northeastern campgrounds, our sites are not paved but they are not dirt either. They are covererd in a product made up of fine crushed stone which allows for excellent drainage. The water you noticed in the sewer is just a water trap that does not effect drainage at all. We are one of very few parks that offer an indoor pool that is open every day during our season. Yes, many of the facilities do not operate during the week in the Spring and Fal but the price you paid is reflective of that. I hope you will consider staying with us again in the future. When making reservations, our staff would be happy to assist you in determining the best time in the season you should come to take advantage of the facilities you would like to use. First time, spent a week here, love this place. Staff was wonderful and friendly as can be. Site was plenty big, only downside to site was large pine trees that dumped a lot of sap on top of trailer. All the activities were great. Place is very well run. I will bring my family back next year. We camped at Lake George RV Park in a Travel Trailer. This is a very nice park. Top notch. The roads are all paved. The sites are very well manicured. There are lots of trees in the main center section, so the sites are a bit more private. There are a few other section around the outskirts that are more open, more like a parking lot. But that is your choice to go there. They have 5 pools. All nice. All clean. But the indoor pool is supposed to be heated, and its still very cold. they are building a new aquatic center in its place next year. The paddle boats are just awesome. They have a dedicated paddle boat lake. A dedicated fishing lake. A theater. Two movie theaters. Arcades. A well stocked camp store. Pickle Ball courts. Lots of stuff to do. This is a really great park. We stayed for a full week and were very happy here. We camped at Lake George RV Park in a Travel Trailer. As most of other reviews stated, the park has everything needed so you never have to leave. The entertainment was great for kids and there were plenty of other things to do at the park to keep everyone busy. Trolly service was great for getting into the village without having to worry about the parking. The only real negative I found with this park was the lack of enforcement of quiet hours. There were no employees around after 10pm and for 2 nights there were a couple loud groups nearby that had very loud music and people outside until midnight. We camped at Lake George RV Park in a Fifth Wheel. This was a nice park. Has all the services anyone looks for. My issues were 1) the proximity to outlets can cause jam ups getting in/out of park, good luck on a rainy day. 2) park is about 5-10 minutes to lake village/lake( could be longer depending on outlet traffic) 3) dog park was best I've seen if you have large dogs, small dog section got no turf, spray area and fit through fence. 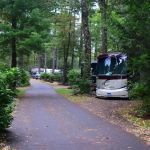 We camped at Lake George RV Park in a Motorhome. Rent boat if you can and explore lake. We had blast tubing and picnicking at lake sites. This place is simply the best of the best. If it was directly on Lake George it would be perfect. We camped at Lake George RV Park in a Fifth Wheel. Enjoy the county bike paths, check out Prospect Mountain, and enjoy the lake. Take the trolley into Lake George very reasonable and avoids parking hassles and expense. Lake George has many great attractions! Local outlet mall is nearby. This is an excellent park in all respects but is only a good value if you plan to make use of all that it has to offer. Lake George Village is a great beach town to walk around. Saratoga NHP is also worth the trip. Wi-Fi sucked...bring a cell plan with you for Internet access. Buy your firewood off site. Very expensive at the store. Sites in the 90's are not forested and although we had terrible Internet, we were able to get satellite, unlike most of the sites. There is so much to do in the Lake George area you cannot possibly get bored. Six Flags outdoor and indoor (water) parks. Tons of stores in several outlet malls. Mini golf up the kazoo. Nearby Aviation Mall, with theaters inside. Restaurants everywhere (must go to George's for dinner, and Martha's - next to Six Flags - for incredible ice cream). Lake George Steamboat Company gives great (and inexpensive) boat rides on the lake, and the mini golf right across the street is tons of fun. Schedule time to enjoy the RV park. We did a lot of activities outside the park which meant little relaxation time in the park. A visit to the southern tip of Lake George is just a few minutes away and very nice. Top it off with a boat tour of the lake, there are different lengths to choose, well worth while. Are you affiliated with Lake George RV Park ?